As a fellow parent, I understand what a precious gift a baby is – and I understand the need to ensure baby has the safest environment around the clock. So, how, especially if you are a first-time parent, do you know when baby is ready to sleep alone? According to most experts, babies should sleep alone, in a bassinet or crib, from birth to decrease the risk of SIDS. Each year in the United States, about 3,500 babies die from SUID (Sudden Unexpected Infant Death). SUID can include suffocation in a sleeping environment, SIDS (Sudden infant Death Syndrome), as well as other unknown causes (Source). If you are environmentally conscious, using organic products may be your preference. 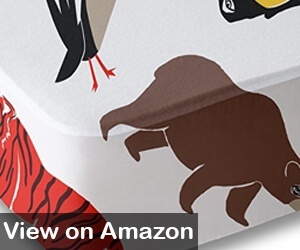 Magnolia Organics Elephant Crib Sheets are made from GOTS (Global Organic Textile Standard)-certified organic cotton and is one of the best organic crib sheets on the market. Magnolia Organics used cotton grown without pesticides or herbicides and uses Azo-free dyes to provide consumers with a 100% organic product. Magnolia Organics is a family-owned business that takes the word sustainability seriously. All their products are GOTS certified from beginning to end – seed to finished product. 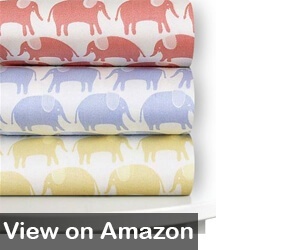 This smooth and luxurious sheet is as beautiful as it is soft, with eco-friendly hand printed elephants. What baby doesn’t love elephants? 300 thread count make this organic crib sheet durable and comfortable. The cute elephants are available in three colors – Sky blue, Wheat, and Roxy pink. Elastic goes all the way around the sheet for a snugger fit. 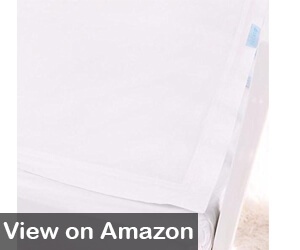 Parents love the quality of this sheet – especially that is does not shrink when washed and dried. The only drawback that I can see is that for the price, you should get more than one sheet. Also Read: Best Toddler Beds – Top Brands Compared! The best crib sheet is a fitted sheet – you do not want the sheet to come loose and smother or choke baby. The LifeTree Premium Fitted Cotton Crib Sheet is gender neutral and is one of the best fitted crib sheets available. Lightweight and breathable for a cool night’s sleep on the hottest of nights. Located in Glasgow, LifeTree is dedicated to providing quality, high-end baby products. 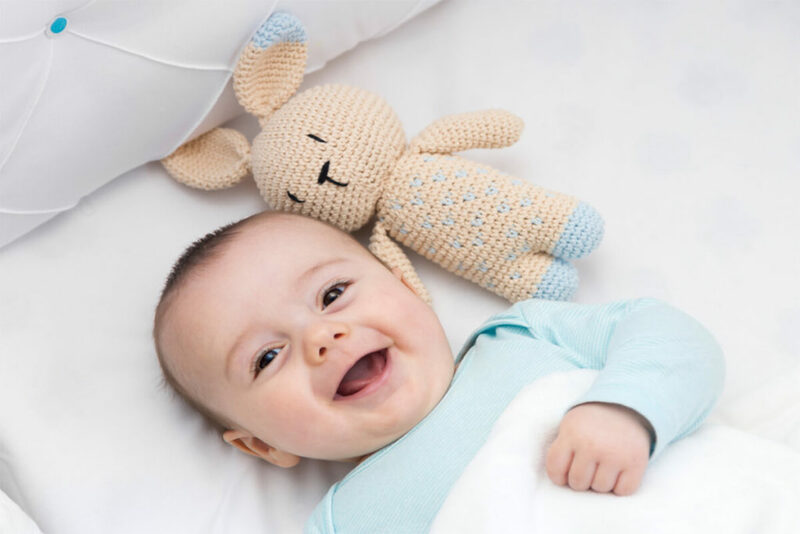 LifeTree has a line of baby products, products for playtime, and products for mom or dad. 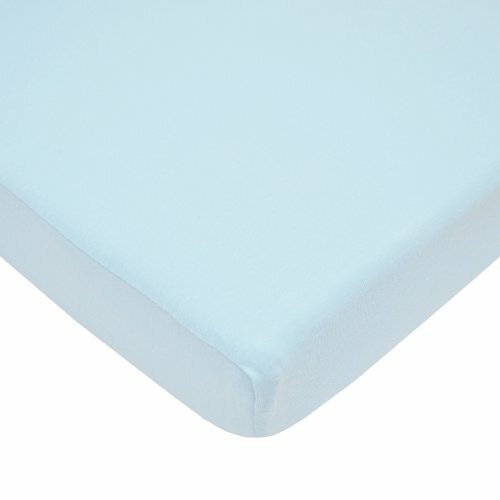 The soft, quality material is soft for baby’s comfort and fits most standard crib and toddler mattresses. 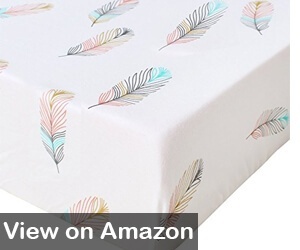 Feather design in neutral colors makes this the perfect sheet for a boy or girl’s bed. Measures 28” x 52” x 9” with elastic on all sides for a perfectly snug fit on crib or toddler mattress. Hypoallergenic – no harsh chemical or toxic dyes. Jersey knit to provide the most in comfort for baby. Thick and soft enough to use as a tummy time blanket. One parent stated the sides do not always stay on tightly. If you live in an area that has cold winters, you know how important flannel sheets can be. For babies, it can be even more important since it is recommended that baby not have blankets inside the crib while sleeping. Flannel sheets provide warmth even on the coldest nights. 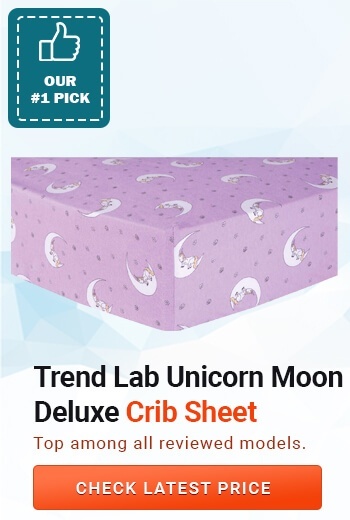 Trend Lab Unicorn Moon Deluxe Flannel Fitted Crib Sheets are some of the best crib sheets for winter. They are soft, breathable, and warm – just what baby needs in colder weather. Based in Minnesota, Trend Lab is a certified women-owned business by the WBENC (Women’s Business Enterprise National Council) – and has been providing quality and trendy crib bedding, room décor, and accessories to help parents create a beautiful nursery environment for baby. Trend Lab flannel crib sheets are 100% cotton flannel for the most in warmth and comfort for your little one on those cold nights. A beautiful addition to any little girl’s room with unicorns sleeping in moons and gray/white flowers on a light purple background. Features pockets that are 10” for a more secure fit on the corners. Full-length elastic allows the sheet to fit snugly and stay in place while baby sleeps. 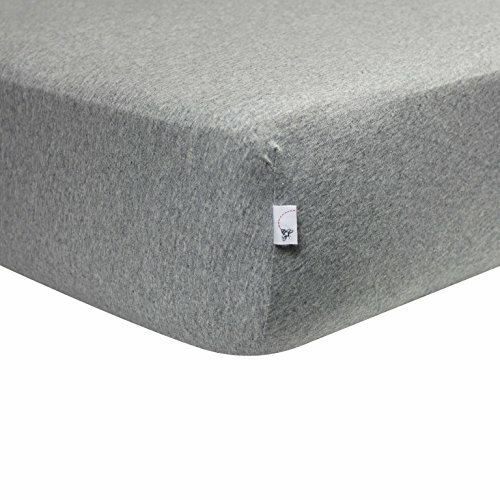 Designed to fit standard crib mattress and toddler mattress. Some parents have stated that the sheet “pills” easily. While some of the best quality crib sheets are the market are fitted sheets, QuickZip Crib Sheets take things one step further in the fitting snug department. The most attractive feature of the QuickZip Crib Sheet is that it wraps around the entire mattress, so there is no worry of the sheet coming loose and posing a smothering risk to baby. Additional top sheets are available, so you can mix and match assorted colors. The fact that the top sheet easily zips on and off means there is no struggling with the mattress to change sheets – simply zip or unzip the top sheet to change. Organic cribs sheets are less likely to irritate the baby’s skin since no harsh chemical or dyes are used during the entire process – from growing the cotton right up to the completed product. If your child has sensitive skin, or skin problems such as eczema, you will want to make sure your crib sheets are 100% organic. Burt’s Bees Baby Solid Fitted Crib Sheets are GOTS-certified as 100% organic. As one of the best organic cotton crib sheets on the market, the super-soft jersey knit makes this crib sheet soft and warm, so baby always gets a good night’s sleep. 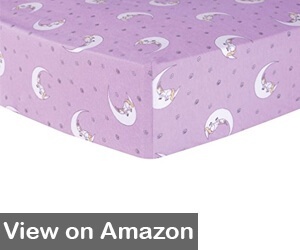 Fits most infant and toddler mattresses. 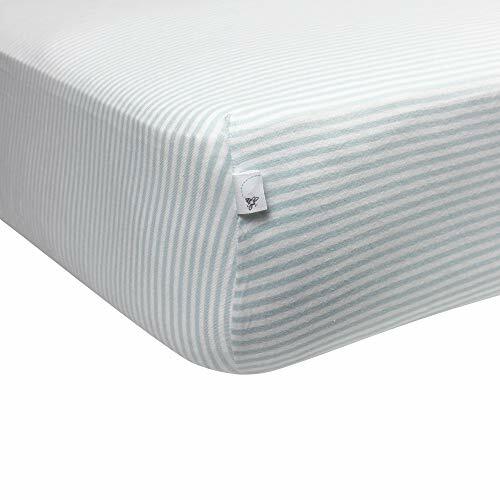 Elastic goes all the way around the sheet for a snug fit and less worry of the sheet coming loose while baby sleeps. Made from 100% breathable, organic cotton for less worry of skin irritation. 140 thread count results in the sheet being thinner than others on the market. Cotton sheets are cool and comfortable. With a 200 thread count and made from 100% organic cotton, Cotton Fitted Crib Sheet by Addison Belle is one of the best cotton crib sheets available. 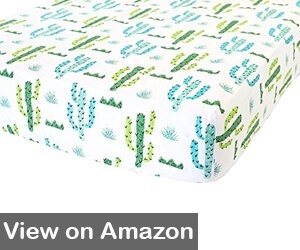 The cute cactus design offers the most in looks and comfort for your baby. Addison Belle is a family-owned business, started in 2015 with a focus on high-end and stylish swaddle blankets. The quality of their products has allowed them to branch into a full-scale business that offers beautiful products made from quality organic cotton and colored only with non-toxic dyes. 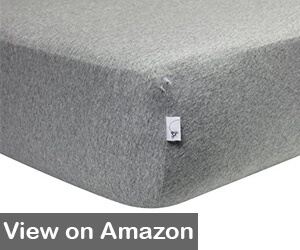 Measures 28” x 52” x 6” and fits standard crib mattresses. 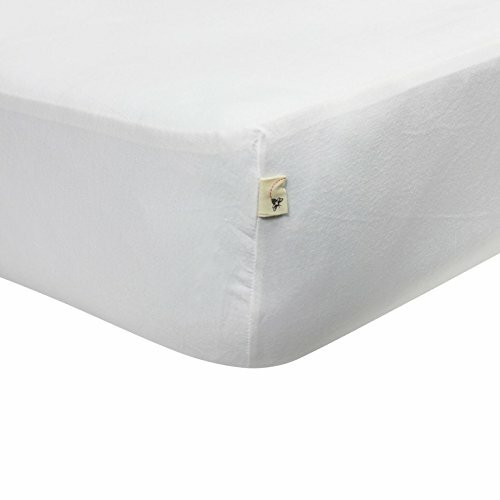 360-degree inseam elastic band creates a snug fit, with less worry about sheet coming off the mattress during the night. The tightly woven percale weave makes this crib sheet durable and soft – gets softer with each wash.
Lightweight and breathable, Addison Belle crib sheets help regulate the temperature and provide baby with a soft, cool environment for sleep. A few parents stated the sheet shrink when washed. 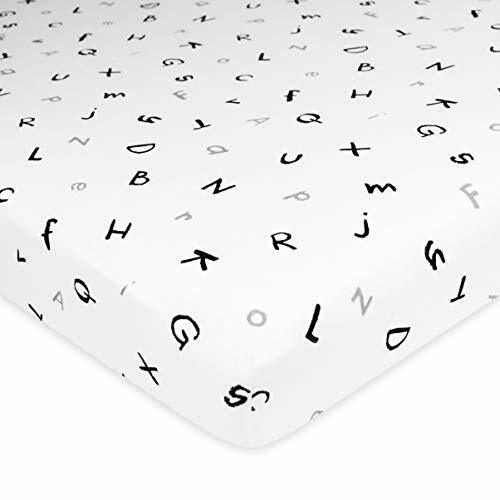 The Animal Print Crib Sheet from Where the Polka Dots Roam is one of the best microfiber crib sheets. The extremely soft microfiber makes this sheet as soft as a 1500 thread count sheet – possibly one of the best crib sheets on the market today. Based in the United States (Kentucky), Where the Polka Dots Roam is a family owned and operated business whose goal is to transform you home into an oasis of beauty and comfort. Microfiber threads offer the ultimate in softness because they are extremely fine – less than 1 denier in width. Where the Polka Dots Roam guarantee their products offer the most in quality and durability. Wrinkle and stain-resistant for more durability. Light-weight and breathable, Where the Polka Dots Roam crib sheets are perfect for any season. The most common complaint from parents is that the sheets fit loosely on a standard-sized mattress. Baby should sleep on a firm surface – mattress in a certified baby crib covered with a fitted sheet. Do not place baby on a pillow. Do not place blankets or other bedclothes in the crib – use a wearable blanket, such as footy pajamas or flannel pajamas to keep baby warm. Be sure crib is free of any toys – especially stuffed animals that can suffocate baby. There should be nothing in the crib except baby. The crib sheet is an important aspect of baby’s sleeping environment. Crib sheets should be secured to the mattress – either fitted sheets or zip on sheets – to ensure baby’s safety during sleep. When shopping for the best crib sheets for your baby, there are several things to keep in mind. Thread count indicates how much thread is used in each square inch of the sheet. The higher the count, the heavier the crib sheet feels = the lower the count, the thinner the crib sheet feels. The most common thread counts are 200, 300, and 400 – with 400 being the best (Source). For baby’s comfort, it is important to use crib sheets that are appropriate for the temperature. Cotton crib sheets are the best for hot weather, while flannel is best for colder weather. Remember, even in winter, you should not used blankets or other bedclothing in baby’s crib, so be sure you are using the correct sleepwear and the correct type of bed sheet to keep baby’s warm or cool as the temperature dictates. There are basically 3 common types of crib sheets – cotton, polyester, and flannel. Pure cotton sheets are hypoallergenic, breathable, and keep baby cool during hot weather. Polyester sheets are synthetic materials and include satin and microfiber sheets. Polyester sheets are budget-friendly but are not as breathable as cotton and are not hypoallergenic. Flannel sheets are soft and durable – and are the best crib sheets for winter months because of their ability trap warmth. Flannel sheets can keep baby warm on the coldest nights. As parents, we take our jobs seriously. Our main goal is to provide our precious little ones with an environment that provides the most comfort and safety. Finding the best crib sheets for your little one is one of the ways you can achieve this goal. We want baby to have a soft, comfortable environment for the most relaxing sleep. We also want baby’s sleep environment to be safe so that WE get a good-night’s sleep. Follow the manufacturer’s instructions when assembling the crib so that each part is installed correctly. Do not use broken or modified cribs. No pillows or thick quilts in the crib while baby is sleeping. No toys or stuffed animals (or baby supplies) in the crib with baby while sleeping. Never place the crib near a window with blind or curtain cords hanging within baby’s reach. Never place the crib near furniture or appliances with cords within baby’s reach – or with anything baby can pull off into the crib. For the best night’s sleep, be sure to keep the temperature in the room at a comfortable level, keep the room dark and quiet. For the first six months, if possible, baby’s crib should be in the room with you – or you should have a dependable monitor for baby’s room. However, be sure there are no monitor cords in the crib with baby to avoid a choking hazard. You will sleep well if baby sleeps well – which will make both of you happier people!